Kochi, Jan 13th, 2019: In a landmark event, boosting India’s Make in India mandate, the start-up world turned to God’s own country Kerala as it got India’s largest Integrated Startup Ecosystem. Inaugurated on Jan 13th, 2019, by Kerala Chief Minister Pinarayi Vijayan, the 1.8-lakh square-feet facility houses incubation set-ups across a string of segments in modern technology. 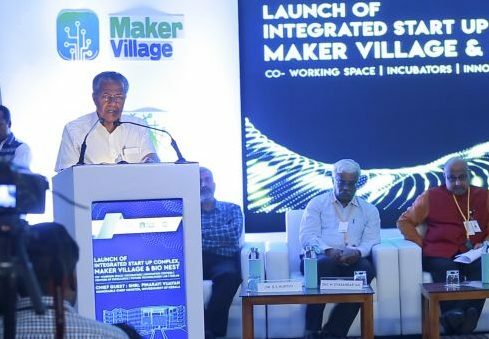 Chief Minister Vijayan inaugurated the Integrated Startup Complex, under the Kerala Startup Mission (KSUM), ultra-modern facilities of Maker Village, for promotion of hardware startups, the Bionest for medical technologies, BRINC – the country’s first international accelerator for hardware startups; BRIC that aids developing solutions for cancer diagnosis and care, and a Centre of Excellence set up by industry majors such as UNITY, Tejas Networks, and Altair. Kerala Startup Mission, the State nodal agency for development of Technology Startup Ecosystem in the State set up this large Technology Innovation Zone (TIZ) at Kalamasserry, Kochi. Spread over 13.5 acres, this Innovation Zone is house to incubators, accelerators, Centers of Excellence in emerging technologies, providing high-quality infrastructure for the development and growth of startups. Once fully developed into a full-fledged campus having over half a million sq. ft. built up area, TIZ would become the largest Work-Live-Play space exclusively dedicated to startups in the country. TIZ is already operational in the transit facilities. Over 100 startup companies in various stages of growth are already operating in the three incubators operating within the facility. The Electronics Incubator Maker Village set up IIITMK in association with KSUM and supported by MeitY (Ministry of Electronics and Information Technology) houses 65 startups working in Electronics Hardware technologies while BIONEST, a biotech startup set up KSUM in association with Rajiv Gandhi Center for Biotechnology (RGCB) with financial assistance from BIRAC, Department of Biotechnology, Govt. of India has 20 companies involved in deep research in biotechnology and allied fields. The facility also has a general purpose incubator with over 20 companies with over 10,000 sq.ft of dedicated for startups in the scale-up stage. During the last 12 months of operation, the startup companies operating in TIZ has filed over 30 patent applications making this as one of the largest IP based incubation space in the country. TIZ also has a full-fledged Fab Lab set up in association with MIT, USA and a large ESDM facility for supporting electronics startups working out of Maker Village. Overall the Kerala Government is working for the state to have a total area of 2.3 crore sq. ft of IT space (up from 1.3 crore sq. ft. last year). The opening of the new complex at the Technology Innovation Zone (TIZ) is a major step towards achieving the objective, CM Vijayan noted in his speech at KINFRA Hi Tech Park, Kalamassery. After the completion of three more projects, Kerala will have startup and incubation space of 5 lakh sq. ft., which will be largest of these type in the world. The State’s startups boast of filing 30 applications for patents startups with the 13.5-acre TIZ, the CM noted, lauding it as a sign of the high-quality work in the zone. Simultaneously, Kerala was sensing increasing optimism in boosting software export from the state. B S Murthy, Secretary, Department of Telecom, Govt of India, Institute of Information Technology and Management-Kerala Chairman Madhavan Nambiar and Dr. Saji Gopinath, CEO, KSUM, Prasad Radhakrishnan, CEO, Maker Village were all present at the inauguration. Kerala’s newly inaugurated Integrated Startup Ecosystem to mirror India’s hardware manufacturing prowess 0 out of 5 based on 0 ratings. 0 user reviews.